Turn fuzzy and dull into clear and bright, especially at night. Night View NV Clip On Glasses turn fuzzy and dull into clear and bright, especially at night. Night View NV Clip On Glasses cut down the glare from headlight and streetlight, reducing eye strain. The secret is the specially coated yellow lenses that block night time glare. Everything will look brighter and clearer. 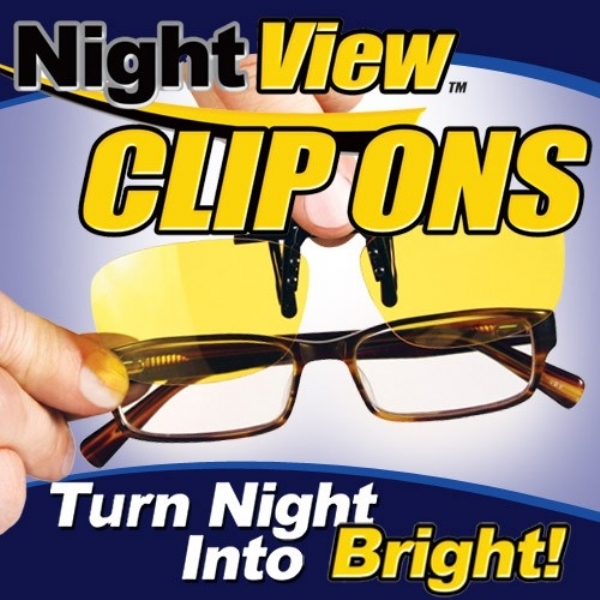 Night View Clip On Glasses as seen on TV provide protection form UVA and UVB rays. Perfect for day and night, cloudy or sunny. They are fine, very sharp and I can see everything clearly. easy to use. headlights facing me not as bad so feel more comfortable driving at night. one lens popped off second time used. used a tiny spot of superglue on the 2 tabs. will see if they hold up.